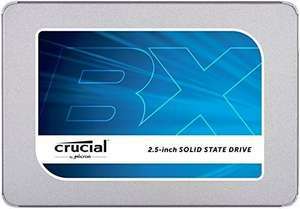 Crucial BX300 CT120BX300SSD1 2.5-inch Internal Solid State Drive, 120GB lightning deal of a whopping 20% off, had this for 3 years! Really amazing piece of lovely jubly hardware. Best deal for this size, yeah? Just need something speedy to boot from for Chrome use. No huge capacity required. Yeh decent of OS drive and 1 game lol but for double the price you can get double the size and ACO? not sure if a deal really, 120 is kinda pointless for most people. Best deal for this size, yeah? Just need something speedy to boot from for …Best deal for this size, yeah? Just need something speedy to boot from for Chrome use. No huge capacity required. Not a bad price (not great though) - I'd rather put my money towards a slighty larger SSD. Maybe Cyber Monday will have better deals. Samsung 850 EVO 250GB for £79.99 on Amazon looks like the best deal. Much better SSD and it comes with free Assassins Creed Origins game. that's a fantastic way to resuscitate an old laptop. from zero to hero in minutes and for a measly price. Bought 525GB SSD during cyber monday last year for £80 from amazon. Considering that this is not a great price. Same company too. Bought 525GB SSD during cyber monday last year for £80 from amazon. …Bought 525GB SSD during cyber monday last year for £80 from amazon. Considering that this is not a great price. Same company too. I don't see a free Assassins Creed Origins in the link is there something you have do to get it with the Samsung 850 EVO 250GB? Scan and Ebuyer are doing it with Assassins Creed. Not sure if it is included with Amazon. Scan and Ebuyer are doing it with Assassins Creed. Not sure if it is …Scan and Ebuyer are doing it with Assassins Creed. Not sure if it is included with Amazon. Yeh decent of OS drive and 1 game lol but for double the price you can get …Yeh decent of OS drive and 1 game lol but for double the price you can get double the size and ACO? not sure if a deal really, 120 is kinda pointless for most people. 120 is enough for the OS which is by far the biggest improvement for most people. 120 is enough for the OS which is by far the biggest improvement for most …120 is enough for the OS which is by far the biggest improvement for most people. So what is your point? 240 GB isn't enough to hold OS and all my Steam games, does that make it pointless? 120GB is enough for the OS, any programs and a couple of games. Seems like the perfect size to me. So what is your point? 240 GB isn't enough to hold OS and all my Steam …So what is your point? 240 GB isn't enough to hold OS and all my Steam games, does that make it pointless?120GB is enough for the OS, any programs and a couple of games. Seems like the perfect size to me. 120 will hold 1 game and the OS, point is the samsung with a free game is just better value, you can easy sell the game for £20, so £20 give or take for double the space and a better SSD all round. How long is a piece of string? All depends on your usage of course. Number of installed apps etc. I have a sandisk 120 and I just use it for Windows 10, and it boots up so quickly that I get really frustrated with PCs that still use HDD. I have a separate HDD with all music, games and files on, so for me a 120 is the perfect size. Yeah, a yeah ago it was all SSD's for goalposts and you could buy a bag of M2's for tuppence ha'penny at the local shop. And you didn't even have to encrypt your data, you could just leave it all there in the open on the streets and tell it to come home when it was dark.